The second workshop of the current ASEAN-QA TrainIQA training took place from 24 July 2017 until 1 August 2017 in Potsdam, Germany. The workshop focused on the evaluation process and on method training as well as the individuell projects of the participants. To get a practical insight into the topic, evaluation at the University of Potsdam in general and on faculty level and the follow-up activities at the University of Applied Sciences Münster were introduced. 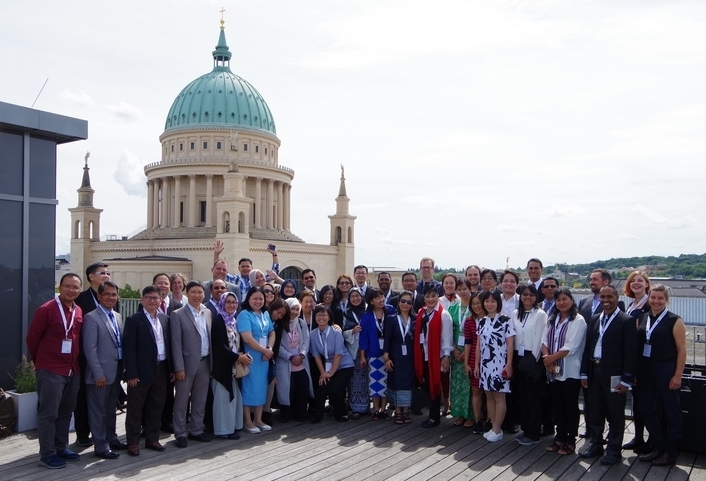 Moreover, the 32 participants coming from universities from nine different Southeast Asian countries visited the HTW Berlin and learnt a lot about their quality assurance system and the special challenges and opportunities of an University of Applied Sciences. The workshop comprised various activities and sessions such as group work, presentations, discussions, hands-on sessions and a panel discussion with different stakeholder of the evaluation process at a university. That mixture allowed everyone to address the content both theoretical and practical. To take the different projects and work areas into account, the hands-on sessions for method training were divided into qualitative and quantitative methods. The group for qualitative methods learnt about interview techniques and conducted an interview in groups up to four persons with students from the University of Potsdam. Afterwards they used the obtained information and data to practice deducing further research questions, etc. Meanwhile, the group for quantitative methods worked with a statistics program on a data set and learnt how to deal with the information and how to assess them. Apart from the training sessions, all particiants had the time to present the current state of their individual project at their home institution, to get feedback from both the trainers and the other participants and to discuss ideas and further steps of development and implementation. Thus, potential problems were obviated and new causes for thought given. The third TrainIQA workshop will take place in Siem Reap, Cambodia, from 24 October to 28 October 2017.